The archive of a hacking case that made computing legal history in the UK and changed all our lives has been deposited at The National Museum of Computing (TNMOC) by Robert Schifreen, the ‘white hat’ at the centre of the 1980’s controversy. 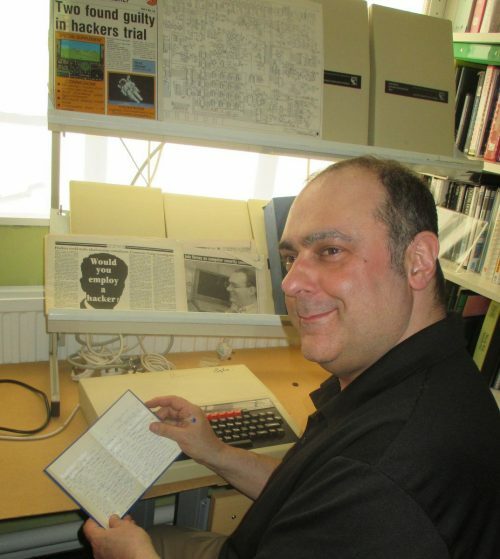 Robert Schifreen relives a 1980’s computing experience ion the TNMOC classroom. The archive tells the story of Schifreen’s two-year legal ordeal following his quite open hack of Prestel, BT’s pre-internet public online system, and his demonstration of his ability to access Prince Philip’s Prestel mailbox. With no anti-hacking law in existence at the time, the archive gives details of the passage of what turned out to be in effect a test case through three courts ending in Schifreen’s acquittal in the House of Lords in 1987. Included in the archive are Schifreen’s 1980’s hacking password book, transcripts of his interviews with police, legal correspondence, the Jury Bundle and a substantial number of press cuttings. In presenting the archive, Robert Schifreen explained the context of 1980’s hacking to an audience at TNMOC. In 1985, the internet did not exist, home computing was beginning to take off, Prestel, one of the first public online services had become available, but there was no real awareness of the need for computing security and no law explicitly against computer hacking. Schifreen, aged 22 at the time, was one of a group of sociable, skilled and inquisitive hackers who, without malicious intent, collected user names and passwords and investigated computer databases not supposedly open to the public. Schifreen explained: “Hackers in those days never started until 6pm because it was so expensive to go online with a dial-up connection before that. But 6pm was a significant start-time because the Prestel security staff had gone home and weren’t there to deal with automated messages telling them that there had been three unsuccessful attempts at a log-on to Prestel. I could read the messages, delete them to cover my tracks before security arrived for work next morning. In effect I was a Prestel System Manager. I even managed to hack Prince Philip’s Prestel Mailbox and was quite open about it. Initially charged and convicted of forgery at Southwick Crown Court, that decision was overturned on appeal by the Lord Chief Justice. After a further appeal by the prosecution, the Lord Chief Justice’s decision to acquit was upheld by the House of Lords. Robert Schifreen went on to become a leading computer security consultant and now runs SecuritySmart, an IT security awareness training company. The archive at TNMOC is available to bona fide researchers. It is growing rapidly already contains the entire 45 year print history (1966-2011) of Computer Weekly, the world’s first weekly computer publication, 26 years of Personal Computer World, and many other magazines, the complete ICL manufacturing archive, the entire Digital Equipment Corporation microfiche and much more.